International air links are already under pressure due to the disruption caused by Hurricane Irma in the Caribbean and Florida. More than 10,000 airline passengers have missed worldwide connections due to storms sweeping across north-west Europe - with travellers later today also facing widespread disruption. The Dutch airline KLM has cancelled dozens of flights serving its Amsterdam hub, including morning services to and from 12 UK airports: Aberdeen, Glasgow, Durham Tees Valley, Leeds-Bradford, Manchester, Norwich, Birmingham, Bristol, Cardiff, Heathrow, London City and Southampton. Around 100 departures and arrivals at Schiphol airport have been cancelled before noon - the vast majority on KLM, but with British Airways, Aer Lingus and Flybe also affected. KLM passengers who have yet to travel are being invited to postpone their journeys to a date up to and including Monday 18 September. 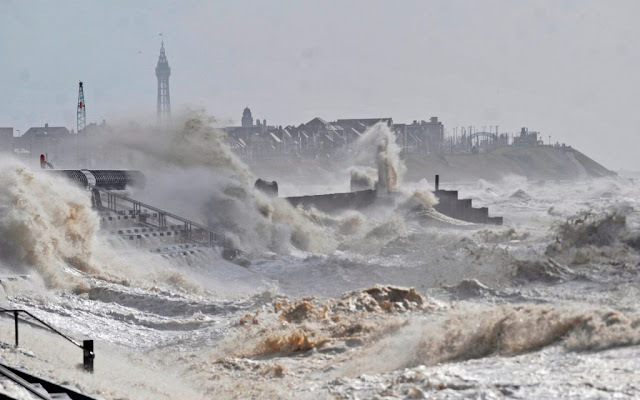 Eurocontrol in Brussels has published a map showing wind speeds of up to (80mph) in the North Sea, with high winds across England, the Low Countries and north-west Germany. British Airways has cancelled at least a dozen flights to and from Heathrow because high winds have slowed the normal flow rate to Europe's busiest airport. Departures to Aberdeen, Dublin, Edinburgh, Frankfurt, Geneva and Nice have been grounded, along with the inbound legs. A spokesperson for BA said: "We're sorry that some of our customers' travel plans have been affected by the strong winds across the UK and northern Europe, which has led to a reduction in the number of aircraft which can land each hour at Heathrow. Airlines are sending some flights to the region to pick up delayed passengers, but cancellations are still taking place.